Here are three takes from the game. A Tough Loss, But a Good Fight? How do you feel about this one? It’s a seventh straight loss and the ninth loss in 11 games, so it’s not going to feel great. And it drops the Huskers to 13-11 on the season and 3-10 in league play. But there was fight from Nebraska, wasn’t there? The Boilermakers have lost four games in four years at home; Keady Court is unfriendly to unfamiliar faces of late. Add to that Nebraska’s penchant for road struggling and not many were expecting the Huskers to stand a chance. Purdue was favored by double-digits. But then Nebraska came out and led 8-4 early. It led 19-18 at the 10-minute mark. It led 25-21, gave up a 10-3 run and then cut the halftime deficit to just two points. The offense registered nine assists on 10 made shots in the first 20 minutes. Purdue played stout defensively and that had more to do with Nebraska shooting 37 percent than any kind of offensive lollygagging. On the other end, the Huskers played maybe their best half of defensive basketball in a while. They ran Purdue off the 3-point line, made it work inside and execute in a halfcourt set and made life hard on star guard Carsen Edwards. At the 14:05 mark, sophomore guard Thomas Allen Jr. snapped the run and gave Nebraska the offensive lift it needed (more on him in a second). For a stretch, the two teams went back and forth. Nebraska never made much ground on what was consistently around a 10-point deficit, but it also didn’t look as bad as the final score might suggest. Missed shots and desperation fouling gave Purdue 10 free throw makes in the last three minutes. But I didn’t really see quit. Isn’t that what everyone wanted? Glynn Watson Jr. had a bounce-back game of sorts. Four points on 1-of-5 shooting with five fouls isn’t good by any stretch but with five rebounds and three assists, it’s a far cry from the no-show performance he had against Maryland the last time out. It looked like a game to build from rather than a continuation of a horrific stretch. Sophomore guard Nana Akenten even went from the net negative he had been in conference play leading up to Saturday to a positive on the court. He got five points and five rebounds in eight first-half minutes. Purdue just had too much offense. 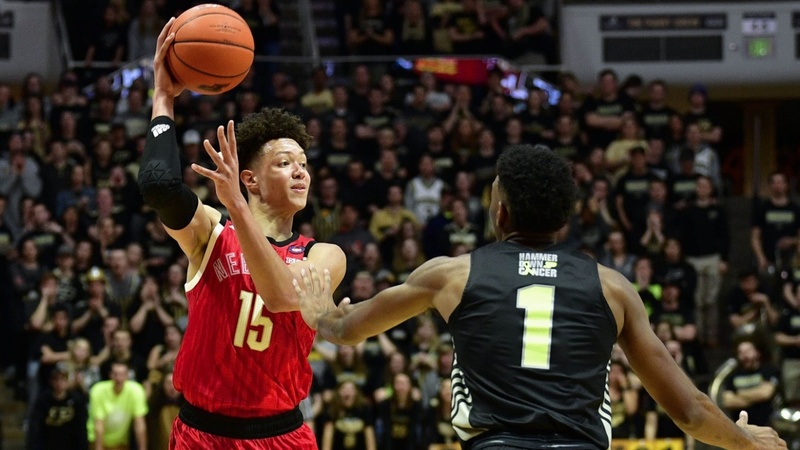 Nebraska shot 38 percent compared to Purdue’s 51 percent and Edwards went for 27 points, 18 of which came in the second half where he was 4-for-6 and 9-for-9 at the free throw line. There’s no shame in that. As a secondary option, Allen was Nebraska’s best offensive weapon. It might be time to make him a primary option. The sophomore tied a career-high with 18 points while hitting six of his nine shots. He buried his first five triples as well, all of them in the second half to keep Nebraska from having the doors blown off. There weren’t a ton of iso possessions or pick-and-rolls called for him, either. Allen was a catch-and-shoot corner guy or a catch-and-drive scorer. He showed the quickness to get by his man a few times on the perimeter when the defense closed to hard on him and got into the painted area. As we’ve seen over the start of his career, Allen has a really nice touch with his floater when he gets inside. Considering he’s not the tallest guy on the court, having some go-to finishing moves amongst the trees is a huge plus. Contrast his scoring to James Palmer Jr.’s, who had 17 points but went 6-of-17 on his way to getting them. Roby reverted back to the floating forward he has been too often this season instead of the attacking mismatch he was to start the Maryland game. And with Watson still trying to recapture his mojo, maybe it’s time to just let Allen run the show. What do you have to lose at this point? Other than more games, which you’re already losing anyway. Is a pick-and-roll game with Allen and Roby, spaced by Palmer and Watson such a bad thing? It affords Watson some cleaner looks if the defense collapses off the corners and it could take some of the defensive attention off Palmer, who is struggling right now to efficiently create for himself or any of his teammates. Allen will be the face of this thing next year, anyway, so why not see how he handles that now with complimentary pieces around him? No, it’s not a win, and this team is well beyond moral victories at this point, but the Huskers are in desperate need of some confidence and maybe going on the road and playing good basketball for stretches is a place to start. Nebraska might not be playing for the NCAA Tournament anymore but they can still salvage some pride and cause some havoc for a few other teams. Minnesota comes to town on Wednesday and the Gophers just got thumped by Michigan State. Nebraska shouldn’t feel as wounded as it has in recent weeks and it will get the chance to play in front of the home crowd again. Maybe something good can come from that. Tip is set for 8 p.m. CT on BTN. We’ll find out then.